“The Undertaker’s Daughter is a wonderfully quirky, gem of a book beautifully written by Kate Mayfield.…Her compelling, complicated family and cast of characters stay with you long after you close the book” (Monica Holloway, author of Cowboy & Wills and Driving With Dead People). How does one live in a house of the dead? Kate Mayfield explores what it meant to be the daughter of a small-town undertaker in this fascinating memoir evocative of Six Feet Under and The Help, with a hint of Mary Roach’s Stiff. After Kate Mayfield was born, she was taken directly to a funeral home. Her father was an undertaker, and for thirteen years the family resided in a place nearly synonymous with death, where the living and the dead entered their house like a vapor. In a memoir that reads like a Harper Lee novel, Mayfield draws the reader into a world of haunting Southern mystique. In the turbulent 1960s, Kate’s father set up shop in sleepy Jubilee, Kentucky, a segregated, god-fearing community where no one kept secrets—except the ones they were buried with. By opening a funeral home, Frank Mayfield also opened the door to family feuds, fetishes, murder, suicide, and all manner of accidents. Kate saw it all—she also witnessed the quiet ruin of her father, who hid alcoholism and infidelity behind a cool and charismatic façade. As Kate grows from trusting child to rebellious teen, the enforced sobriety of the funeral home begins to chafe, and she longs for the day she can escape the confines of Jubilee and her place as the undertaker’s daughter. “Mayfield fashions a poignant send-off to Jubilee in this thoughtfully rendered work” (Publishers Weekly). I have tried to remember the first time I saw a dead body. There have been many odd firsts in my life, like the first time I touched a dead person. I was too short to reach into the casket, so my father picked me up and I leaned in for that first empty, cold touch. It was thrilling because it was an unthinkable act. But I recall no first viewing because from the time I entered the world there were always dead bodies. When I was old enough to understand what they meant, people told me they felt decidedly creepy about funeral homes. I knew a woman who always ran to the other side of the street whenever she happened upon ours. She gave a little shudder when she saw me seated in the swing on the veranda. I nodded to her and remained silent, having no need to defend my position, and anyway, sooner or later she, too . . . But I could understand how one would think it a bit unnatural to spend day after day, year after year, entertaining the grieving and caring for their dead. It could have been a gloomy existence were it not for my father. Whenever I mentioned “undertaker” or “mortician” to people who’d never met him, I saw in their eyes what they thought. They pictured a dour man, a Uriah Heep sort who wore black, scratchy suits with dull white shirts fading to yellow. Nowadays, people raise their brows when they think of the modern undertaker, who burrows down in courses such as General Psychology and Dynamics of Grief, Mortuary Law, and Death and Human Development. These men are thought of as exploitive, nothing more than ruthless businessmen. My father would have squirmed at being compared to them. Each funeral was an opportunity to imprint his stamp, the details of which bore his personal touch. Not one strand of the corpse’s hair should go astray, not one of a family’s requests should go unheeded. A final perfected image, a memorable experience, was his unwavering goal. He never had to work too hard at being different, he just was. Frank Mayfield was a clotheshorse, an undertaker with flair that verged on dandyism. He thought nothing of driving miles to hunt down a better-quality suit, no easy task given that our little, rural town did not border any large metropolis. My father allowed me to observe as he groomed his dark brown, wavy hair into a matinee-idol sweep. I sat on the sink or stood in the claw-foot bath to gain a little height and squirted the Brylcreem into his palm, but the stuff did nothing to tame the dramatic widow’s peak that marked his forehead. Long, curly, black lashes accented his hazel eyes, and a prominent swath of dark eyebrows ran across his forehead. I swear he looked like a movie star. He never struggled when dressing. His fingers and hands played with his diamond cuff links as I imagined they might have swept up jacks and a ball, nimbly and quickly. The eye-catching ties did not demand extra time or attention, but magically knotted themselves into place as if he were only there to assist. He had leaned over hundreds of men as they slept the deep sleep of death, slipping their ties under their collars and knotting the fabric one last time. His reputation depended upon the perfection of such a task. On the last day of 1959 my father, the Beau Brummell of morticians, piled us into his green-and-white DeSoto and drove away from Lanesboro, the city in which my older brother and sister and I were born, and toward a small town on the Kentucky-Tennessee border. Though only a ninety-minute drive, it might as well have been to Alaska. Gliding into Jubilee, our big boat of a car circled the town square and headed toward the residential section of Main Street. My father pulled over, and our five dark heads turned to face a huge, three-story, slightly run-down house. In this old house he would finally realize his dream of owning his own funeral home. Back in Lanesboro, I had been the first in our family to be carried as a newborn from the hospital directly into a funeral home. Birth and death in almost the same breath. My brother and sister, Thomas and Evelyn, had enjoyed living in a normal house until my father’s employer forced him to move into the funeral home in Lanesboro so that he could be available at any time of the day or night. “Well, if we’re going to live in a funeral home, it might as well be one that I own,” he’d said upon deciding to move. My mother told me that the first week after our move to Jubilee, I held on to the hem of her skirts and would not let go. Where she went, I followed. “You wouldn’t let me out of your sight,” she said. Then I turned a corner, let go of that familiar fabric, and slowly became fascinated with the funeral home. The front door opened into the office, a space from which traffic seemed to want to flow and not linger. My father kept it simple; he thought a plush office would appear pretentious. His hefty wooden desk nearly dwarfed what was barely a room at all. In front of the desk and against a windowed wall, several wooden folding chairs formed a row into which family members sat to make funeral arrangements. In this room the families of our town made difficult decisions, sometimes numbly asking how this event came about so quickly. “Why, just the other day Truman was mowing the lawn . . .” My father would gently steer them back to reality. When a death occurred, an entire series of rituals shifted into gear. My father led each grieving family on a journey as they completed the necessary funeral arrangements. From the office, they first approached a large foyer. On the right, the Hammond organ loomed in a small corner, and on the left, they walked past the large, open entry that led directly into the chapel, where their recently departed would be on view in a matter of hours. Opposite the chapel’s doorway, a tall staircase flanked by a wooden banister led upstairs to our private rooms. Most people respected the boundary and resisted the temptation, but something about a nice staircase beckons. One night while the people downstairs milled about during a visitation, I lay sprawled on my stomach upstairs leafing through a coloring book. Crayons were scattered on the carpet. I heard the familiar creak of the stairs, which I assumed was my mother making her way up for the evening. I quietly walked toward the top of the stairs, where, in a dull glow that emanated from the lights downstairs, stood a beanpole of a man wearing overalls and a suit jacket. Shocked and suddenly vulnerable in my nightgown, we stared at each other. “Who are you?” he asked, his mouth agape. “Who are you?” I took a step back. That happened occasionally, when the rooms downstairs were full of people and it was hard to keep track of everyone. Beyond the staircase, the foyer narrowed into a hallway so dim that a ceiling light burned throughout the day. To the left, a small, humble hospitality room was comfort enough for those who came to visitations and funerals. Here families and their friends paused for a hot or cold drink and murmured in low whispers. An old-fashioned snack machine stood against the wall filled with packs of Planters peanuts, Nabs crackers, and candy bars that dropped into the tray after the money rattled down. Bright red knobs protruded from the cream-colored frame, and I could almost hear the old machine asking to be touched. “Not so hard,” my father would say when I pulled with all my might. Farther down the hall to the left was a door that always remained closed. This room pressed upon my childhood, possessing the power to scare the bejesus out of a grown man, conjuring the stuff of nightmares. This room housed the monstrous white porcelain table, the knowledge of which hastened my step when I walked past each day: the embalming room. My father ushered family members past the embalming room where their loved one lay under a crisp white sheet, to the door facing them at the end of the hall. This was “the showroom” where they would choose the casket. One of the last choices the family made with my father took place in the casket room, my room of cold comfort, the only room downstairs spacious enough to accommodate a large array of caskets. It was, as if by design, the end of the journey. This journey from the front of the funeral home to the back, made with countless families over the years, became the rhythm of my childhood. One of the first things my father did when we moved to Jubilee was to contact Southern Bell to make sure we had enough telephones. The telephone, which brought news of tragedy and death, was our lifeline. At that time funeral homes also operated as an emergency service. As the world’s surgeons became more skilled, the reasons to bring doctors’ patients to the hospital increased. Funeral-home ambulance service began as an outgrowth of their need to transport human bodies supine in their long hearses. When a citizen needed to go to the hospital, or just wanted a ride to the doctor’s office, they called the funeral home of their choice. The telephones in our new house were sacred objects, and one could be found in almost every room downstairs and upstairs. They rang at all hours of the day and night, the volume cranked as high as it could go. Every time they rang, it sounded like a house full of alarm clocks going off. Two of them sat importantly on the corner of my father’s desk. On each of the flesh-colored telephones a row of clear-plastic buttons lit up whenever we received a call. I couldn’t keep my hands off them and played with the buttons when no one was looking, intrigued by how the light flashed first and the tone came afterward, like a warning strobe light—death calling, death calling. I still can never hear a phone ring without thinking that someone, somewhere, has died. When a death call came the entire atmosphere in our home changed instantly. My father ran out to the three-car garage in the back of the property and revved up his Henney-Packard ambulance. What a piece of fast-rolling machinery. The Packard ambulance—a smaller version of our black hearse, which had the sharp, sleek lines of the later-model Cadillacs—looked like a long, fat cigar. It was known for its disturbingly named “suicide doors”: the back doors were rear-hinged and susceptible to all manner of dangers. If one of them opened accidentally, the force could cause the ambulance to swerve either into oncoming traffic or onto the side of the road—and that wasn’t the half of it. “Do you remember the undertaker in Mullen County?” My father loved to tell this story, erupting in peals of laughter before he began, which anyone listening echoed. “This undertaker, Fred Bowles was his name, picked up a patient at his home to take him to the hospital. It wasn’t an emergency; the man just needed a comfortable ride. Well, the patient’s doctor was at his house, too, and wanted a lift in the ambulance. Fred told the doctor to sit in the front, but, no, this old crank just had to sit in the back with his patient. I remember Fred said he was pretty hot under the collar about it. You know, everybody thinks they can just sit back there, go for a ride like they know what they’re doing. Whenever my father set out to bring a body home to us, my mother became the noise police. She marched through the rooms upstairs like a sergeant major, her solid frame following her headfirst walk, spreading the word to her children. I sighed. Another one? A dead body in the house meant we would be sequestered. Even though many of Jubilee’s dead rested with us over the years, we were the ghosts of the house. Our family learned how to disappear with those four words: “We’ve got a body.” From the time the family of the deceased first entered the door to make arrangements until days later when the last person left after the funeral, our family became invisible, nonexistent. We tiptoed around upstairs and whispered to each other when it was necessary to communicate. The sound of music or the television would not be heard in our house until the last mourner walked out the door. Foods that emitted strong odors were out of the question so that we wouldn’t offend the bereaved with a reminder of life going on above them. The volume of the chiming phones was lowered to a softer, duller ring. The days and evenings of visitation culminated in the funeral service. The chatter of the visitors halted, the movement of people downstairs calmed, and now, during the actual funeral service, we weren’t even allowed to speak or walk upstairs. We created a hush and the house fell silent. Funeral services were usually held in the afternoons when Thomas and Evelyn were at school. Thomas was already in junior high school and Evelyn was two years behind him at the end of a less than spectacular grade-school career. They were more occupied with new teachers and friends than the business of death. Thomas was particularly industrious and soon became familiar with Jubilee’s various neighborhoods when he began a paper route. He delivered the Nashville Tennessean, a daily afternoon paper that occasionally reported on a few counties in Kentucky. Jubilee’s newspaper came out only once a week, filled most prominently with the news of lost cows, ice-cream-supper locations, and, most important, the obituaries, which my mother proofread with a magnifying glass like Mr. Sherlock Holmes. Kindergarten was held only in the morning and I was home by lunchtime. I was funeral-home trained from the beginning. When school closed for the summer break, Thomas and Evelyn climbed into the cloth seats of the Greyhound bus for the trip to Lanesboro, where, once there, they parted ways and visited cousins, aunts, uncles, and grandparents. So for the first few years I bore the brunt of the daytime silences alone. When death came visiting and I was forced into silence, it felt like a lock had been turned and I was shut off from the world for a period of time, isolated from any living thing. It was difficult in the beginning, like jumping high, both feet off the ground, and trying to pause in midair. With my arms folded and my face screwed up in a stew I sat quietly, swelling with resentment and irritable that yet another person had died. But as I grew older and death continued to claim our citizens, I learned why silence was necessary: Respect. This is the word I heard consistently during my childhood. When a life fades and ends, the family deserves a quiet place to mourn. I gradually made peace with a life that demanded to be lived in quantities of silence. Resentment flickered to acceptance, and boredom fell away, replaced with a curiosity about what went on downstairs. My mother, intolerant of noise at any time, was perfectly suited to this line of work. Childish expressions of emotion irritated her. She must have invented the phrase “If you don’t stop crying, I’ll give you something to cry about,” which she threatened whenever she spanked me. She was the disciplinarian of the family. My parents must have agreed that her job was to relieve him of the burden of attending every scrape, fight, tug-of-war, disobedience, whine, and moan that three children were sure to muster. Although she often threatened us with “I’m going to tell your father,” he rarely stepped in. I blamed sour-faced Bretta West for my mother’s ability to slip so easily into funeral-home mode. Bretta, my mother’s mother, was a strict Southern Baptist. She and her husband had settled on a small farm in western Kentucky, where she was a Bible-reading, churchgoing, no-nonsense woman who didn’t believe in dancing or music other than hymns and who insisted on modest dress. Two things Bretta would especially not tolerate were noise in the house and sassing. I never saw Bretta laugh, and on the few occasions when she smiled, her eyes crinkled up and narrowed as if she were in pain. I thought her face would crack from the effort. My mother was accustomed to being on her own. By the time she was ten her older brother and sisters had already married and were living in Lanesboro, the largest city near them. No other children her age were within walking distance, so she entertained herself with a few wooden toys, a doll, and her pet squirrel, Fuzzy, who lived outside in a nest at the corner of the house. My mother doesn’t remember ever being punished. “You never got in trouble for anything? Nothing?” I once asked. We always had our evening meal together as a family, but like her mother, my mother had expectations for our behavior that were positively Victorian. She demanded our elbows off the table, polite passing of the food, napkins in our laps, and a minimum of table talk. This was exactly how her meals with her parents must have been, except for one thing: I enjoyed a good supper conversation. “That’s enough.” A clear warning was in her voice. He’d just sat down to dinner having embalmed a body, and his fingers were prunelike from the tremendous amount of water he used. He never wore the ghastly rubber gloves that hung from the handle of a storage cabinet in the embalming room. They were actually old-fashioned autopsy gloves he’d bought from the hospital. They dangled in the air, an awful brown color, swollen, larger than a big man’s hand. When he made the effort to work in them, they were so thick and heavy he became annoyed, pulled them off, and flung them on the floor. This was long before the fear of disease and the invention of latex gloves. My father never interfered with my mother’s constant quest for silence, but the slight lift at the corners of his mouth told me that he was sometimes on my side. “You do not talk about this subject at the table. Now be quiet.” She passed the mashed potatoes. But of course she and my father spoke of nothing else. “It looks like Mr. Simmons will be dead by morning,” my father would say. “You’re so stupid,” Evelyn said. “That’s enough,” my mother intervened. “She’s so stupid.” Evelyn had to have the last word. My mother knew absolutely that children could be trained to be still and silent. Her mother wasn’t the kind of woman who had the time or patience to teach her youngest how to cook or clean, nor did she invite her to sit with her at the sewing machine while she made her clothes, nor into the garden to plant beans and tomatoes. Like me, my mother turned to her father for attention, and there, too, she met lessons in silence. Charles West, my mother’s father, worked the land-based oil fields in western Kentucky during the 1930s. After the roughnecks had drilled the wells, hauled the supplies, and laid the pipelines, they relocated to the next potential oil field. Charles was a pumper, the man who stayed behind after the others moved on. He monitored and maintained all the equipment, working as a caretaker of a producing oil field. During the summer, my mother would clamber up into his pickup truck and accompany him to work. She stood a safe distance from the heavy equipment in the humid summer heat, a solitary figure in her brown leather lace-ups. Black ringlets of hair fell to her shoulders; her homemade dress caught an occasional breeze. The air smelled nothing at all like gasoline or tar; the odor of crude oil registered as something sweeter, softer, as it filled her lungs. She followed his movements as he walked down the pipeline to the tune of a whole field full of equipment; the pump-jack sang a steady song, the cling-clang of tubing, rods, and valves its chorus. They lunched together in the shade of the truck with crinkled paper bags in their laps, biting into thick-bread, roast-beef sandwiches and sharing a thermos of iced tea. On Saturdays her father often took her fishing, but she couldn’t sit still in the small boat. She squirmed, rocked the boat, stood, and leaned over one too many times, until Charles scolded her and threatened to leave her at home in the future. She learned to sit still. She learned to be quiet. Then she lost him to the final silence. On one of those unpeopled oil fields, surrounded by the pumping, grinding equipment, something went wrong. A piece of equipment fell. He didn’t die immediately, but later, in his home, of internal injuries. It was hard to prove in those days that his death was caused by an accident on the job. There was no compensation. She was fifteen when her father died. My mother may have been a seeker of silence, but I wasn’t. Living in a funeral home was unnatural to me. During the funerals and in the evenings when the townspeople filed through the front door for visitation, I often felt I couldn’t sit still for another second. Out of sheer boredom, I crept to the landing at the top of the stairs, from where I heard the sounds of the people below. This was risky. One only need look up to see my loose hair hanging down and my nightgown floating in the air, my mischief a distraction from their mourning. It being so vital that the scene downstairs not be disturbed by our presence upstairs, my mother grew overly sensitive to our movements. One night I leaned over the railing and peered down at the row of ladies with violet-rinsed hair who sat just below me. Among the elderly women sat a young girl who suddenly burst into song. The song had no words; a light la la la rang above the ladies’ low hum. The sound of her voice rose up into the air to the exact spot where I stood. My mother, convinced I was the culprit, came toward me with her lips pressed tightly together, her eyes narrowed into angry slits. She grabbed me by the arm and spanked me before I had a chance to proclaim my innocence. Before I could say anything, she clamped her hand over my mouth so that I couldn’t respond. I tried to wriggle away, but she held on with a strong hand that smelled of Jergens lotion. The child sang again and my mother knew she’d made a mistake. “You should never have been standing there in the first place!” she hissed. The apology I awaited did not materialize. My mother didn’t like to be wrong. My legs stung for a second or two from her spanking, but my feelings . . . they were bruised for days. Small, weepy hurts like this later snowballed into disagreements that ended at an impasse with my mother and drove me downstairs to my father, where I felt more accepted. On the days when she wasn’t around, I crept back to the spot, where I would close my eyes and listen to the rhythm of it all. Everyone grieved differently. Some mourned in silence; I thought maybe they cried silently inside or saved up their tears, too embarrassed to weep publicly. The first time I heard a wailer, I jumped from my seat on the stairs. It’s hard to forget the sound of someone wracked with sobs. It scared me to death—I thought she was dying. I was relieved to hear the notes from the Hammond organ. My soon-to-be piano teacher, usually chatty and mischievous, was on her best behavior as she played the mournful hymns. Totty Edwards was a musical woman who had slipped right out of her nun’s habit when she found love in the form of Victor. She told me Victor was “from the plant,” as if he had sprouted from the earth. An explanation from my parents revealed that he was a business executive the local toolmaking company had recruited from The North. My mother thought she was crazy. What she really meant was that Totty was different. She was different because she, too, was from The North. “Somewhere in Michigan,” my mother said, as if it were near the Arctic. I tried to understand what this had to do with being from The North. As far as I could make out, people from The North were bad timekeepers, wore tall boots, and played bridge quite atrociously. These things made them crazy and not to be trusted. But I liked Totty’s Northern accent, which sparked my imagination. She spoke so quickly, like short flashes of lightning. I imagined everyone in The North raced about their day, speaking in clipped spurts while we walked through molasses elongating our vowels. One day after a funeral, I noticed Totty had placed a strand of beads on the organ. I asked to hold them. My mother overheard me and was furious. It was as if I had intentionally betrayed the Baptists. I had no idea what rosary beads were. I thought Totty’s string of black and silver beads was a necklace. I didn’t take the huge silver crucifix hanging from it as anything other than decorative. Good Lord, the sign of the cross jumped out from all sorts of places all over town, most prominently in the jewelry section of the drugstores, on sympathy cards, and church signs of every denomination. None had anything to do with Catholicism; how should I know that Totty’s was a Catholic cross? As I sat on my secret perch waiting for the service to begin, the heady, concentrated odor of the flowers in the chapel found its way up the stairs. It took some time for the flowers to warm up; they stood in buckets in the refrigerator of the local florist and arrived with a chilled, subdued aroma. Soon the lights and the warmth of the people who filled the rooms summoned the fragrance of roses, carnations, chrysanthemums, and gladioli, and the marriage of their scents gathered strength as the day progressed. Occasionally a lady’s eau de toilette drifted through the air to merge with the perfume of the flowers. These were the days and nights of mourning; the funerals I heard and smelled. I recognized my father’s footsteps during the funerals, which wasn’t difficult because he was usually the only person allowed to walk around during a service. Even so, his slow, deliberate stride was distinctive. He was in his element—master of the grand finale, directing families through the hardest, most uncomfortable forty-five minutes of their lives. My admiration teetered when I faced the world without him. One of the teachers in our school always sniffed when she passed me in the halls, as if I carried the odor of the dead. Suddenly the warmth of a blush rose from an understanding that his profession was offensive to some. Then her mother died and my father was called upon to bury her. The teacher’s sniff was replaced with a little nod. Oh the glee of that comprehension, the little skip in my step, the satisfaction I felt. I was filled with an awareness of his unique duty in this little scrap of a town. He and his employees communicated with eye contact and barely noticeable hand motions. They never spoke to each other during a funeral. If my father looked at one of his men during the service, that man knew exactly what he should be doing at that particular moment. A quick glance to one of them meant to seat the latecomer. The slightest nod of my father’s head to another was a cue to move toward the front. A subtle hand motion toward Totty and he became the conductor of music. At the end of the funeral the men dared not move toward the casket without his signal. In the beginning, my father hired a few part-time men to help out during the funerals and visitations, but he also took on a full-timer who knew nothing about the funeral business. Sonny was a Beacon County boy, hired because he had connections. He knew everyone outside Jubilee who lived on the farms and in the little one-street towns in the county. And my father badly needed a Beacon County representative. Sonny was a big oaf of a man whose large, protruding ears looked as if they might help him take flight. He often placed his fists on his thick waist and looked down at me, frustrated by my mere presence. Sonny and I were never going to be friends. I sensed his false civility immediately, which was easy to decipher by the way he became bossy in my father’s absence. “Leave the mail alone. Go on upstairs now,” he would say. “I don’t have to. I live here.” I would pretend to read the latest embalming supply catalog to solidify my existence. Sonny lumbered through the hallways in stereophonic thuds, but somehow managed to quiet his footsteps during the funerals. He would station himself in the back of the chapel, his rounded shoulders only slightly squared by his rumpled suit. In stark contrast, my father, immaculately dressed, stood in the front to one side of the casket, alert and present during the entire service. Whatever awkward emotions squirmed in the minds and hearts of funeralgoers, my father was at ease with them. While he conducted funerals, he was as comfortable in his own skin as he was in his beautiful clothes. And that was a thing of solace to those who were grief stricken. His task was to close the door on the messy sight of death and open another to the heavenly ever after. Some people thought their preacher opened that door, but from my balcony seat, it always looked to be the undertaker, whose smooth orchestration made saying good-bye a less difficult task, a more assured journey. Especially when the preacher was Brother Vince. Oh Lord. After Totty attempted a couple of hymns, Brother Vince, who was today’s Representative of God’s Word, stepped up to the podium in front of the casket. He began with a prayer that blessed everything from animals to tractors and finally wound down to the deceased. Then he took his glasses off, placed them on the podium, and reached into his back pocket for his handkerchief. While he cleaned his glasses, he began his dry-bones eulogy. This funeral sermon was full of imagery of the gruesome Bible story of Ezekiel. He relied on this sermon when he didn’t personally know who lay behind him in the casket. He varied it, but the basics were always there. Brother Vince was off and running and wouldn’t draw breath for another fifteen minutes. Following a long piece wherein Ezekiel walked on the bones while conversing with God, the preacher’s tinny voice headed for the home stretch with a hypnotic repetition of the promise of life everlasting. Cue Totty’s heavy foot upon the pedals as her fingers searched for the final notes. At the end of the service my father stood in front of the casket and without uttering a word made the slightest gesture with his palms up, just a small movement right in front of his chest, and as if by magic, the congregation stood. He offered his arm to the grieving sister, which she took gratefully. His head bowed, he led her to the funeral car. He was never accused of showing false sympathy. When it was all finally over, my father’s friend Billy, who helped out during the funerals, climbed the steps to where I sat waiting, fists on cheeks. “Is it over?” I whispered. I ran. I ran anywhere I could, just to feel what it was like to move again. The silence downstairs was abruptly broken, the rooms were vibrant with action all around like a circus ring with each performer soaring at the height of his or her act, an organized chaos. As my father led the cortege to the cemetery, the employees rushed around in unison. They carted flowers out, maneuvered chairs to clear paths, cleaned as they worked, loaded the flowers into the van, and rushed to the cemetery so that the flowers would magically appear at the burial site before the slow procession arrived. Totty gathered her music and tidied up the hymnals. My mother manned the all-important instruments of the trade—the phones. She raised the volume, because no one knew when, but the ritual would begin again at any moment. I wondered why my father chose to wake up every morning to take care of dead people. But I never asked, for as the years passed, I could imagine him doing nothing else. He grew up on farmland during the Depression, a place called Red Hill, not far from my mother’s family, with fertile land that produced a bounteous supply of food and goods. They were free from worry about their next meal when so many others suffered. His mother, Katie, a statuesque, handsome woman, was quietly proud that she bought only sugar, coffee, tea, and flour at the general store owned by her sister, Marybell, and Marybell’s husband, Wallace. Everything else was at their doorstep. My grandmother Katie was industrious and created her own little business by selling her top cream at the store. My mother said a surprise spot-check of her mother-in-law’s house would produce less than a teaspoon of dirt. Katie wore dresses on the farm, great flowing things that whipped around her legs as she moved about. She loved big hats and coats with huge fur collars. Her husband’s idea of dressing up, on the other hand, was a fresh pair of heavy cotton work pants, and though I never saw him wear a suit until the day he was buried, I was given photographs to prove that he did. My father’s childhood was full of noise, a completely different home life from my mother’s. His brother and sister were not much older than he, and the three were a raucous trio. A slew of cousins, among them Marybell and Wallace’s children, often visited the farm, where they roamed the countryside unbridled. As quietly behaved as we were at Bretta West’s house, when we visited my father’s family, we were free to be as noisy and playful as he had been. Being older, Thomas and Evelyn were more accustomed to visiting our grandparents’ farm. On the weekends, with the congregation of the cousins in full session, they took turns riding the ornery horse and fished in the farm’s expansive lake. They played football and cowboys and Indians. Too young to be included in such games, I was unaccustomed to farm life; to me it felt like visiting another country in which there were countless miserable tasks like cleaning the chicken coop and hauling water from the well. If not for one vivid detail, I would scarcely remember the house before my grandfather installed indoor plumbing: the outhouse terrified me. The wind whipped around the wooden shack and banged the door open and shut. It was so dark inside I groped to find the seat, which was too big for me. I closed my eyes and prayed that I wouldn’t fall in and that no spiders would crawl up from the depths of the pit. I worried about splinters. Good grief, I pleaded, take me back to the funeral home. My father was the youngest of the three, and although his father was quite straitlaced, his mother indulged him. Aware he was not inclined to work the land, his parents never forced him. He gravitated to the city of Lanesboro, which overlooked the Ohio River, originally known as Yellowbanks for the color of its soil. The action of the river town spoke to him, and the buzz of people made him feel alive. He enjoyed wearing the kind of clothes that were out of place on the farm. It was no surprise when I learned that he spent his high school vacations working in the menswear department of J. C. Penney’s. The management placed him in the men’s glove department, hardly a hub of excitement in the hot summers, but it was a natural fit and better than the fields. On a late summer’s day in 1942, Frank sat with his elder brother under the big shade tree by the lake on his family’s land. Everyone called him Jimmy, but of course he was James Maple to my father. As the two skipped pebbles into the quiet water, he discovered that James Maple had no intention of being a farmer either. Sitting on a spot of land that offered so much life, James Maple told him that when he returned from Europe, he was going to be an undertaker. Frank had laughed. My father could have told me himself that it was first his elder brother’s dream to become an undertaker. But the war intervened and sent the brothers on two entirely different paths. Frank served on the ground in C Company of the 137th Infantry Regiment of the 35th Division. James Maple spent the war in the air, on the underside of a B-17 as a ball-turret gunner. When his plane was shot down over Germany, he was captured and held prisoner. James Maple never became an undertaker, or anything else. Years later his bones were sent back to Kentucky in a sealed box. My father, suffering the effect of his own war wounds, received the box on behalf of his grieving family from the hands of an undertaker. 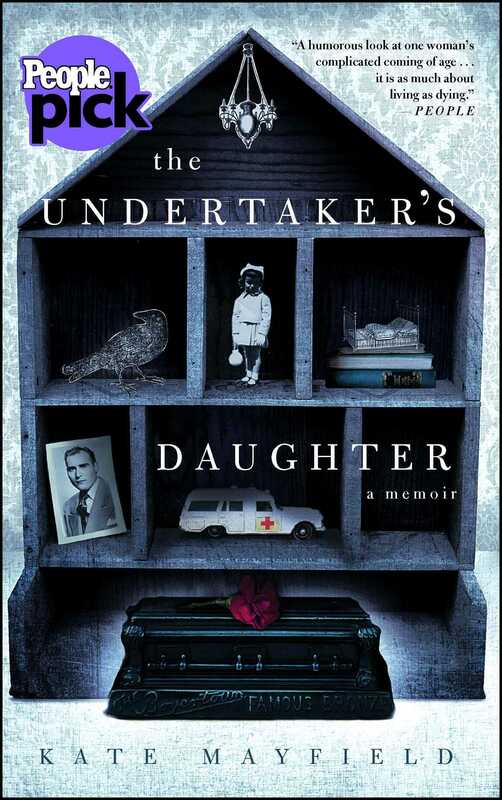 This reading group guide for The Undertaker’s Daughter includes an introduction, discussion questions, ideas for enhancing your book club, and a Q&A with author Kate Mayfield. The suggested questions are intended to help your reading group find new and interesting angles and topics for your discussion. We hope that these ideas will enrich your conversation and increase your enjoyment of the book. The Undertaker’s Daughter offers a child’s account of the business of death. Kate grew up in a funeral home in southern Kentucky during the turbulent 1960s. Her father, the charismatic Beau Brummel of morticians, splashed onto Jubilee’s segregated community as one of its two white undertakers. A philanderer and a secret alcoholic in a small, God-fearing community, he opened the door of their funeral home to family feuds, fetishes, and victims of accidents, murder, and suicide. The living and the dead entered their house like a vapor, in ways that only the South can conjure. They were a community peppered with flawed characters who learned there are no secrets in a small town, except the ones with which we are buried. This stirring memoir reveals Kate’s extensive research into her father’s life and his time serving in Europe during World War II, including her discovery as to the touching reasons her father chose to become an undertaker. 1. In what way does the prologue story of the bridge game set the tone for the book? What themes are foreshadowed here? Discuss specific examples and how they relate to later scenes. 2. On page 14, Kate contrasts her father’s appearance and comportment with the stereotypical view of “mortician” or “undertaker.” What images do those words conjure up for you? Did Kate’s father live up to your expectations? Why or why not? Can you imagine yourself in that profession? 3. Discuss Kate’s descriptions of her father’s reverence for death, the dead, and the paraphernalia of death. When did this reverence cross the line to affect his family? In what ways was Frank both selfless and selfish in the sacrifices he made for his business? 4. On page 24, Kate describes a typical family dinner, at which she was admonished not to talk about death at the table, even as her parents “spoke of nothing else.” How was death a taboo in Kate’s family, even as it permeated all aspects of their lives? What other taboos were there among the Mayfields and in the town of Jubilee? What are Kate’s contributions to these secrets, and how do they later lead her to feel as if she is “two people” (page 249)? Are there any ways in which you similarly lead a secret life? 5. Kate experiences funerals from evolving vantage points as she grows up, beginning with her secret perch on the stairs, and later as the organist. Describe the things Kate notices most at different points in her life. What details stand out to you from funerals you’ve attended? What is the main reason Kate agrees to fill in as the organist? 6. Much of what Kate knows about her father’s secrets she learns from family members, friends, and, later, historical records. Why doesn’t Kate simply ask her father these questions? What is the reason Kate eventually learns her father chose his profession? What other events impacted his choice? 7. Kate had several hiding places while growing up. Describe these getaways. What was the most unusual, and why was that her favorite? Share your own secret getaways as a child and why they were important to you. 8. Kate describes only one close childhood friend, a girl named Jo who moves in two doors down from the Mayfield funeral home one summer during their early teens. Why are she and Jo are drawn to each other? How is Jo different from other girls in town? What deeper secrets do we later learn Kate and Jo share? Why does Kate feel she is closer to Jo than to her own siblings? 9. How does the “business of death” (page 43) differ from how we experience death as mourners? How is this underscored by Frank’s description of the different views people have on selecting a casket? How is money sometimes just as much a taboo as death? 10. Frank spends “thirteen years toing and froing” (page 94) Miss Agnes around town, taking her meals on holidays, and seeking her counsel. What effect does this relationship have on the Mayfield family? Why does Lily Tate agree to their arrangement? How does Miss Agnes help Frank’s business, particularly concerning the Old Clan? Why do you think Miss Agnes chose to develop a special relationship with Kate, out of all the Mayfield children? 11. Kate weaves stories of the lives and deaths of the townspeople of Jubilee into her memoir. How do these stories contribute to the flow of the book and our understanding of Kate’s experiences with death? Which one evoked the strongest feelings for you? Choose your favorite of these stories and share the reasons why with your group. 12. The strong reaction to desegregation displayed by adults in her life was incomprehensible to young Kate. Discuss the differences between how blacks and whites in Jubilee lived, died, and grieved. What were the consequences of the intersection of these two worlds? Identify some of the ways that both Frank and Kate cross over this line. 13. Kate first feels the contrast between the smallness of Jubilee and the “great expanse of America” (page 175) during a family trip to the beach. How does Kate’s desire for the freedom of a larger world manifest? Revisit the afternoon where Kate and Jo discover the musician Charles Mingus (page 209). How does this experience solidify Kate’s idea that she might visit or even live in a place far different from Jubilee? 14. On page 274, Kate calls the funeral business “the most segregated business in Jubilee and in the whole of the South.” Do you agree with this claim? Why or why not? Identify other social institutions that Kate observes as heavily segregated in Jubilee during her time there. 1. Kate notes that many of the people of Jubilee are uncomfortable with the idea of children living in a funeral home, and expects that there will always be someone who finds that “distasteful . . . creepy, even abhorrent” (page 244). Would her family’s arrangement be considered unusual today? Interview a local undertaker and ask his or her opinion. How did he or she get into the business? Is the term “undertaker” still used? Ask these and any other questions the memoir prompts for you, and then share the details of your conversation with your book club. 2. Consider the dynamics of the Mayfield family and of Jubilee from the perspective of another of Kate’s siblings. Using examples from the book, share with your group how you think this sibling may have experienced specific events. 3. People are frequently more comfortable talking about death in general than the reality of their own eventual deaths. Do you view death any differently after reading this book? If so, how? Consider how you would like your own funeral to look. How does thinking about that make you feel? If you feel comfortable, share your vision of your funeral with your book club. 4. Kate speaks with her father about what happens to bodies after death and discusses the influence of her Christian upbringing (p 231–33) on her beliefs at the time. Choose a non-Christian religious practice and research the beliefs and rituals surrounding death in that tradition. Share your findings with the group, comparing and contrasting those with Kate’s father’s, and with your own beliefs and their foundation. 5. The television show Six Feet Under follows a family of brothers who run their father’s funeral business after his death. Choose three episodes of this show to watch with your book club, then compare and contrast the show with Kate’s memoir. What similarities and differences are there between this book and the show in terms of how the business of death is portrayed? This book is a departure from your previous two books, which were much lighter reading. Why did you decide to write your memoir? What was the most challenging aspect? What do you hope readers take away from your story? I began preliminary research for The Undertaker's Daughter before I cowrote my second book, so I’ve been thinking about it for a long time, weighing whether or not I had a unique story to tell, but also a story which carried universal themes. Odd though it may sound, one of the most challenging aspects in writing this book was that I felt too close to the material. I changed most of the names, and even the place names, to help me gain much needed distance. More than anything, it is my hope that readers will be entertained and swept away in a time capsule by a story that is set in a very specific place—a funeral home in the South—in a unique time in America’s history. The deaths you write about are natural, with the exception of the Sheridan family and Linda Mayberry. Are there ways in which, as much as you were exposed to death, small town life also isolated you from it? I can’t recall a time when I’ve ever felt isolated from death. Though you give detailed treatment to your father’s care in embalming the dead, cremation is never mentioned. What was the general view on cremation during your father’s tenure as an undertaker? Was this a function of the culture of the South, or the era? Cremation was not performed at that time in our town, and I’m not sure it is now. As a child I didn’t even know of its existence. Some ancient cultures consider cremation cleansing and holy. That was not the case in the South, in the eras in my book. Before people conformed to the idea, it was considered a violent thief of the lasting, peaceful image that people sought. Major adjustments in the culture’s thinking regarding cremation were needed before it finally crept up on the South’s psyche and became more acceptable. On page 237, you note that people have long chosen to “incur debt rather than forgo their idea of a good death.” What is your idea of a good death? What role, if any, does the dying process play? How do you imagine your own funeral? I preface my answer with a reminder that I’m not a death expert or a bereavement counselor; I’m a writer who happens to have had a great deal of experience surrounding death. As much as modern society seeks to cushion against an agonizing, untimely, or tragic death, unless the person is very old, or in a great deal of pain, people don’t generally want to die. How can you have a good death when you don’t want to die? Hospices, the aforementioned counselors and others help to create a better death, a more comfortable death, but I’m not convinced that there are good deaths. Perhaps the efforts to create good deaths are more for the benefit of the surviving family members and friends. I anticipate uproar as people rise to debate this! You intersperse stories of your family with brief vignettes of the funerals of particular people in Jubilee. Which of these was the most memorable or poignant for you? Were there any others about which you couldn’t bring yourself to write? If so, why? I can still see Linda Mayberry’s dead face as clearly as if it were yesterday. Her death image is the definition of haunting. I challenged myself not to shrink from the most difficult funerals and deaths, so I’ve written about them with as much detail and honesty as I could muster. It wasn’t easy, but I didn’t expect it to be. You write in vivid detail about the sometimes violent encounters between your older sister, Evelyn, and yourself and your younger sister, Jemma. How have your relationships with your siblings and your mother evolved since your father’s death and your move overseas? When a patriarch is the first in the family to die, usually one of two things happens: the family is drawn closer, or the family splinters. Though I was the only sibling to leave the state and then the country, I felt that each of us trod our own paths after my father’s death. We’ve lived in waves of closeness since, moving in and out of each other’s lives depending on circumstances. On pages 42-¬44, you tell the story about the first time you sensed a presence in the room with a body. Is this something you still experience? What do you believe about the afterlife? A few years ago I visited a funeral home in Kentucky, not as a mourner, and I accidentally stumbled into a kind of waiting room where a body was laid out in a casket, ready to be moved to the chapel for visitation. I was alone with the deceased and much to my surprise I experienced that same feeling that had scared me in my childhood. I can’t explain it. I don’t seek out these experiences as I once did. It just happened. I have no belief in the afterlife whatsoever—I can’t prove it exists and I can’t prove it doesn’t. You heard various stories about your father’s war injury from various sources. Before reviewing his medical records, which version held the most credence for you? Do you regret not asking more questions of your father growing up? If Frank Mayfield were alive today, what questions would you ask him? The version my father told me of having been shot while guarding a building conjured the clearest, simplest explanation. I could image it more easily than the ride in a jeep during which an arrested enemy soldier grabbed his gun. That version sounded too much like Hollywood. It is more difficult than you might imagine to sit at the bedside of a dying parent while each of you attempt to disclose your secrets, your innermost thoughts, your regrets, or even an expression of love. Again, it’s a great scene for a novel or film, but it rarely happens in real life. Perhaps more people are choosing to tie up loose ends and heal old wounds now, I don’t know. I didn’t because my father was very ill and in great pain. My younger sister’s and my entire thrust at the end of his life was to help him feel more comfortable, not to ask him questions. Even though I was quite inquisitive of my father when I was younger, I wish I’d not accepted silence for an answer. I wish I could have found a way to talk to him about his experiences in the war without hurting him in the process. I’d like to know what he and Miss Agnes talked about all those years and what, exactly, made their friendship so strong and unique. I’d like to hear him articulate what drove him. My mother shared with me her experience of being married to him, for which I’m grateful, but I would also like to know if later, in his short life, he had any regrets about how hurtful he had been. I would ask him what dreams he had for his future life, the life he might have had before he became a boy soldier, the point at which his life changed forever. You describe in the epilogue Miss Agnes’s “donation” of her house to the public, and your most recent return to Jubilee, including a walk through your childhood home. How do you look back on Jubilee now? The axiom that all small towns are the same drives me quite mad. I don’t think that’s true. Jubilee was particularly insular at that time, which breeds its own unique small town idiosyncrasies. Other than the time I’ve spent writing this book, I don’t think about Jubilee. Two stories stand out in particular about how your sense of your own mortality changed rapidly: a delivery to the funeral home of miniature coffins, and the death of Linda Mayberry. In retrospect, do you agree with your parents’ decision not to hide death of any kind from you and your siblings? How do you believe children should be introduced to the idea of death? It would have been futile for our parents to try to hide death from us. Death was in our home, in our lives twenty-four hours a day. It would have been difficult to enforce a rule that downstairs was off-limits, not impossible, but difficult. Pandora’s box . . . I don’t have children and I’m not a teacher, so I wouldn’t presume to offer advice on how to introduce them to the idea of death. It’s not too hard to understand the dying process; it’s black and white, from antemortem, to perimortem, to postmortem. What happens next is the complicated part of their education. I would hazard a guess that the explanation partially depends on the family’s religious beliefs, if they have any. On the final page, you note the recent “surge in people who seek to demystify the subject of death and its history and rituals” (page 348). Discuss your participation in the Death Movement. What impact do you feel this movement has on the culture of death? I have one foot in, one foot out of the Death Movement. My interests lie in historical practices, the inclusion and romanticization of death in literature, and the tantalizing search for immortality. Here in Britain, people are much less comfortable talking about death, especially their own, than they are in the States. People are living longer, and because of that many haven’t seen a dead body until they’ve reached their thirties. Compared to Victorian times when the population was dying in large numbers from cradle to mid-age, that’s shockingly late in life to witness a first death. There is an entire spectrum of attitudes toward death today; people are both fascinated and frightened by it, and for many it represents something macabre and even unclean; for others it is a forbidden subject. In some parts of the world today there are people living with the dead, either in their homes, or in cemeteries, such as the tombs of residences in the City of the Dead in Cairo. The Death Salons and Death Cafés I’ve attended have been incredibly respectful, informative, and revealing. Many people leave cheerful and unburdened. It’s not a party; those attending who have little time left keep things appropriately sober. I think this movement will grow as the number of elderly in our population increases. 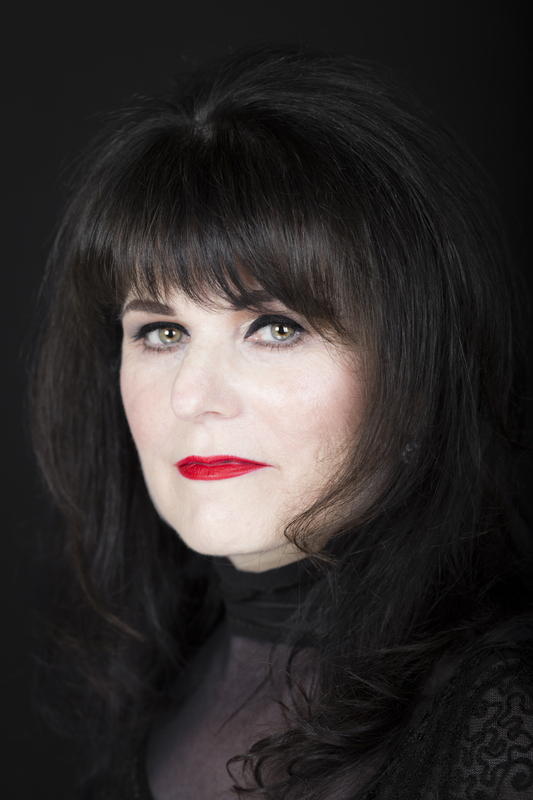 Kate Mayfield is the author of The Undertaker’s Daughter (a memoir) and the coauthor of Ten Steps to Fashion Freedom and Ellie Hart Goes to Work. A graduate of the American Academy of Dramatic Arts in Manhattan, Kate lives in London.